Beijing: Tsinghua University Press & Springer, July 30-August 1, 2007, Beijing, China, 267& CDROM. Abstract Bridges in China are always suffered from the overload traffic. So precise assessment for the safety of the bridges is important. Nonlinear FE analysis with the consideration of damage accumulation, material nonlinearity and boundary connection is a powerful tool for this problem, which is cheaper than test and more accurate than linear FE analysis. But nonlinear FE analysis for prestressed concrete bridge in China still has not been widely accepted. Hence, in this paper, a nonlinear FE analysis for a prestressed continuous rigid frame concrete bridge is implemented with the comparison of a large-scale bridge experiment so as to discuss the modeling technique and to verify the result of numerical model. Nonlinear behaviors such as prestress, cracks, crush of concrete, yield of rebar and contact of support are taken into account. Ten different load cases to represent different overloads are all simulated in both FE model and experimental model. Through the analysis, it can be concluded that nonlinear FE model correctly monitor the performance and damage of the bridge. During the service life of a bridge, it is impossible to avoid damage accumulation and function degeneration due to traffic load, fatigue effect and material debasing. And with the recent fast development of the economy in China, over loading happens more frequently than any time in the history, which brings serious safety problem for the bridges. Every year there are lots of reports on the sudden failures of the bridges that induce terrible lost and death .So precise assessment for the safety of the bridges is important. However, it is too expensive to do enough experiments so as to analyze the work state of the bridge. Nonlinear FE analysis with the consideration of damage accumulation, material nonlinearity and boundary connection is a powerful tool for this problem, which is cheaper than test and more accurate than linear FE analysis. But nonlinear FE analysis for prestressed concrete bridge in China still has not been widely accepted . Hence, in this paper, a nonlinear FE analysis for a prestressed continuous rigid frame concrete bridge is implemented with the comparison of a large-scale bridge experiment so as to discuss the modeling technique and to verify the result of numerical model. Nonlinear behaviors such as prestress, cracks, crush of concrete, yield of rebar and contact of support are taken into account. Ten different load cases to represent different overloads are all simulated in both FE model and experimental model. There were ten load steps in the experiment, in which stage five oil jacks applied as the vehicle loads. And four load patterns were tested to simulate the movement of the vehicles (Fig.3). The whole test process was listed in Table 1. Load Case A, B and C were repeated twice in turn with different load values to simulate various levels of overloaded vehicle movements on the bridge. And Load Case D was finally tested to destroy the bridge so as to obtain the load capacity of the bridge. 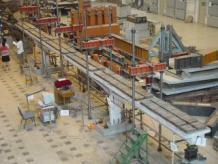 In the whole process, dynamic performance was tested so as to detect damage of the model bridge. Maximal load of each jack: 37.5kN. Maximal load of each jack reaches 50kN in load step 5, and maximal load of each jack reaches 55kN in load step 4 and load step 6. In the test, load step 1-3 monitored the service state, most of the flexural cracks fully propagated during load step 1-3. Load step 4-6 monitored the over loading state, in which the normal steel reinforcement progressively yielded and the tendon was still elastic. Load step 7-10 was destructive loads. In the last load step, the bridge damaged seriously, some cracks expanded through the whole section. However, because of the tension of prestressed tendons, every part was connected together and the bridge didn��t collapse. The typical phenomena observed in the test were shown in Table 2. A finite-element model of the model bridge was established by the software MSC.Marc. Plane stress element was used in this model because in plane bending deformation was the main behavior of the bridge. Planar rebar element was adopted for the prestressed tendon model. The nodes between tendon elements and concrete elements were coupled so that no slip in the rebar-concrete interface is considered. In the two side support, contact surfaces were introduced to monitoring the real bridge support which can bear press only (Fig. 4) . The elastic-plastic material model is adopted for the concrete in compression, while smeared crack model is adopted for concrete in tension. The equivalent stress-strain relationship for concrete is based on the Chinese Code . Perfect elastic-plastic model is adopted for steel including rebars and tendons. By using these models, a numerical procedure for nonlinear analysis such as concrete cracking and steel yielding was presented. In addition, the load history was also considered by loading and unloading. The computed result was shown in Fig.5. Besides, the crack distribution of the test results and finite element results was also compared, which was shown in Fig.6 and Fig.7. By comparing the curve between the test results and the computed results, it could be concluded that the behavior of the bridge could be simulated by finite-element analysis. FEA is a powerful tool to do nonlinear analysis, which can help to estimate the work state of the structure. Through the comparison between the test results of a bridge model and the nonlinear analysis results, it can be concluded that nonlinear FE model correctly monitor the performance and damage of the bridge. The authors are grateful for the financial support of the National Key Technologies R&D Program (2006BAK01A02) and the Key Teacher Support Program of Tsinghua University. 2. Lu XZ, Yang N, Jiang JJ. Application of computer simulation technology for structure analysis in disaster. Automation in Construction, 2004, 13(5): 597- 606. 4. Liu YK., Experimental Study on Prestressed High-strength Light-weight Concrete Continuous Rigid Frame Bridge, Master thesis, Beijing: Tsinghua University, 2006.